A great man once said "The past belongs in the past". And do you know what? He's right you know! History is always a subjective thing given the benefit of hindsight. Because memories can change direction in the same manner as a tempestuous summer's day breeze. Just ask the Actor / Director: Clint Eastwood, as well as Gene Hackman, Morgan Freeman, and Richard Harris. But please, only in 1992 and for 131 minutes. 'Come with me to Texas' says the Schofield Kid (Jaimz Woolvett) to the legendary assassin, William Munny (Clint Eastwood). 'There's a bunch of prostitutes who've placed a bounty on the heads of two cowboys over there, due to the fact that they've disfigured one of their very own" he continues. But can he do this? Can William actually leave behind his two kids, his farm, and the memory of his dead wife? Especially since he's a bit rusty when it comes to killing folks for a living! Or will he just wait until the Schofield Kid leaves instead, and then decide to travels to his old friend place, Ned Logan (Morgan Freeman), who'll help him make up his mind? Hey! Wait a minute. I know who can answer this question for us. That sheriff from Texas who's building himself a house. You know the one I'm sure. Little Bill Daggett (Gene Hackman). But hold on a sec. We best not ask Little Bill at the moment. Hell no. Currently he has his hands full kicking the crap out of that British maverick, English Bob (Richard Harris), who rides on into town, to stakes his claim on this said same 'whores gold'. BANG! POW! SLAP! CRACK! KICK! Is Little Bill finished now? Oh! Now he is. Finished beating on Bob like he beats on William when he follows in his footsteps. Still, three days later, the times change as quickly as the wounds heals from Williams face. Prompting to what next yo transpire to be a right rooting tooting free for all I can tell you! As death comes in three's - culprits are hung by trees - vengeance comes a knocking - and some men will never be a stopping. OK, I have to be honest with you, folks. 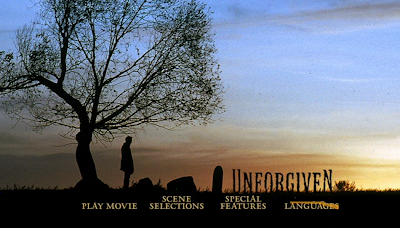 'Unforgiven' is one of my all time favourite classic westerns in cinematic history. The story is simple yet multi-layered. The ambience is moody and atmospheric in tone. The casting is truly inspired. And it also comes with one single ingredient that make it stand out from the crowd: Clint Eastwood. You see, Clint brings something to this movie that no other actor ever could: His own unique association with this genre of movie, plus a way of looking at things that is very fresh and dynamic. To elaborate a bit more if I may: (1) The inclusion of the W. W. Beauchamp character, as played by Saul Rubinek, is a very clever plot device that is at the centre of this film. Conceptually, it shows how history is always being rewritten by the media, and for many years now, most of Clint's projects have had an alternate yet truthful take on popular fiction, conveying that what you see isn't always the truth. In many ways Beachamp is the precursor too many of the films Clint saw when he was a child, perverting youthful minds with a fictionalised version of reality. (2) The William Munny character is easily an evolution of some of the other maverick outlaws Clint has played when he was younger. It was very nice to see that Clint recognized this aspect within William, thus giving him the opportunity to dabble about within his own myth, whilst expanding upon a new one. 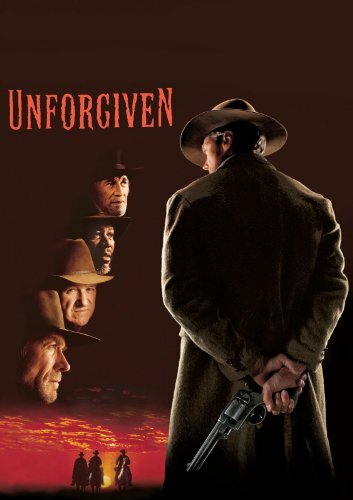 (3) The world of 'Unforgiven' is masked in shades of grey, because all of the main protagonists feel that what they are doing is for the right reasons. The prostitutes feel justified for placing a bounty on the heads of those cowboys, because the law turned its back on them when they desperately needed them. William and Ned feel justified for going after this bounty, because they need the money to tend to their own families. And Bill feels justified for behaving in the way that he does, because deep down inside he sees himself as a wholesome peacemaker, trying to defend his town by reasonable means. True, right? All of these things are pure Clint through and through. Just like these filmic-facts: (1) Clint dedicated this movie to two of his directorial mentors. Don Siegel [from Dirty Harry] and Sergio Leone [from The Dollars Trilogy]. (2) Clint's mother had a small part in this flick, but she was cut out from its final release due to its running time. Clint apologized to her whilst he was accepting his Oscar. (3) Clint wrote the main theme for this movie with some assistance from composer, Lennie Niehaus. (4) The screenplay, written by David Peoples, drifted around for nearly thirteen years before Clint Eastwood bought the rights to make it. Moreover, it took Clint an extra seven years before he actually got around to doing it. (5) Clint asked Gene Hackman to base his character on the then Los Angeles police chief, Daryl Gates. (6) David Peoples has publicly stated that the Martin Scorsese masterpiece, 'Taxi Driver', and the Glendon Swarthout novel, 'The Shootist', were the two major influences in writing this screenplay. 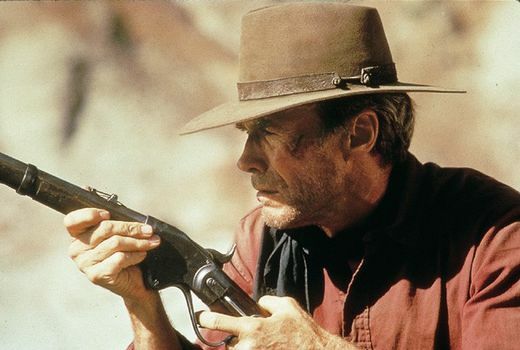 (7) Clint wore the same boots in this film as he did on 'Rawhide' and the 'Sergio Leone' films. Clint says that for him these boots symbolize the beginning and the end of his 'western career'. (8) The lady who played the head prostitute, Strawberry Alice, is in fact Clint's first wife, Frances Fisher. And (9) 'The term 'The Duke' was a reference to Hollywood movie star, John Wayne. Plus the term 'Snake Eyes' was a reference to Lee Van Cleef, Clint's co-star in two of the 'Dollars Trilogy'. A true classic. I cannot say any more than that.